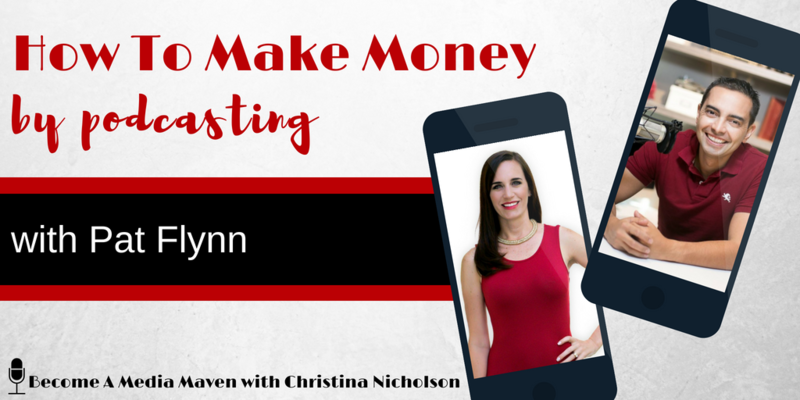 In this episode of Become a Media Maven®, I speak with the podcast master himself, Pat Flynn. Pat has taught me everything to get my podcast up and running… so no pressure having him on, right?! I’ve known Pat for a couple of years now and he surprised me with some things we talked about in this episode. Did you know he was an extra in a movie? Or that he’s making thousands of dollars in passive income helping… food truckers? In the third episode of Become a Media Maven®, Pat is sharing how his business didn’t start with podcasting, but he credits the Smart Passive Income Podcast to his success and business growth in affiliate marketing, speaking, authoring multiple books, and more. Listen to find out more about how you can build an audience to grow your brand to help more people and make more money. I belong to his program Power Up Podcasting, which taught me exactly how to build a podcast through modules that take you step-by-step. You really can’t start one thing until you finish the thing before. It really forces you to take action because if you don’t, moving forward in the online course would be useless to you. Power Up Podcasting shows you ‘this plugs into this and this is where you drag your mouse’ so that it’s really simple to do and as long as you follow the steps, you’ll get it done. the benefits to doing so by having multiple income streams, creating passive income, and so much more. On my podcast, Become A Media Maven®, first I wanted to talk to Pat about his podcasting life and how it all got started because that’s valuable for those of you wanting to start a podcast or to start a business. He started his online business by first taking the LEED exam, which is an exam that architects, designers, and people in the construction industry take about green buildings or environmental design. Pat grew up wanting to be an architect, he went to school for architecture, and got a great job coming out of college in the architecture world. Then, he was laid off in 2008 (like a lot of other people) and decided to start an online business helping people pass the architectural LEED exam… and that business took off. It was actually a podcast that helped him discover this world of online business. He took a lot of their advice and used their training and courses to build a website. Then, a lot of his friends and colleagues were asking how he built this business. How did he build this website? How did he turn it into a business? From there, Pat decided to always implement that in all of his businesses… and his next foray online was to create a blog to show people how all this was done AND to just be fully transparent be sharing everything that was done, everything to do to build new businesses, everything that was done right, everything that was done wrong, how much money was being made, where it was all coming from, and learning why the income increased this month or it went down this month. Pat’s blog was started in 2008. Then in 2009, he started a YouTube channel that had tutorials to show people how to do some things that were more easily done with visuals, like video, versus just written texts on a blog. In July 2010, he published his first episode of the Smart Passive Income podcast. Podcasting is also a great way to collaborate and communicate and build a relationship with other influencers in the space. Having a podcast gives you an amazing asset to leverage to invite people on and have a conversation with them. Pat recorded his first episode three times because he claimed to have no idea what he was doing. First, he winged it, then he wrote down every single, scripted word, then he worked with bullet points. That’s what worked. “My good buddy John Lee Dumas says, you have to be a disaster before you become the master,” Pat said. What Pat described reminds me of when I was doing my first live shots on TV. I remember the first couple of ones I tried to write out everything I was going to say, word for word, and memorize it (because when we’re live in the field we don’t have a teleprompter). After the first two times, I realized this is terrible because if I say but instead of and or vice-versa then I was totally thrown off and I messed up the whole thing. From then on, I just reminded myself that ‘I know what I’m talking about, so I’m just going to do bullet points’ and I’ve done thousands of live shots since then following that same guide. TIP: Don’t memorize what you’re going to stay. Just have your bullet points and you’re good. There’s blogging, having a YouTube channel, a podcast, and so many other options. What is it about having a podcast that draws a bigger audience? People consume podcasts for much longer. Therefore, your message/your voice is in their ears for much longer. The more time you can get in front of people to insert yourself, your message, and your brand into people’s lives for much longer, you’re able to drive home those call to actions more often. You’re able to build a deeper relationship with your listeners. People begin to build a habit of listening to your show because it’s so much easier to listen to a podcast than it is to watch videos. For instance, when a person is on a commute, on a walk, or at the gym, you’re able to get in front of people and places that they wouldn’t normally be able to consume your content if they’re just watching videos or reading your blog posts. You have the ability to connect with other influencers, who then will mention your podcasts because there’s a lot of cross-promotion in the podcasting space… and it helps the algorithm. This is Pat’s story about how his podcast first took off and started gaining popularity and more followers. Those listeners were already listening to that podcast so it’s very simple for them to go and find Pat’s on that platform and subscribe. Now, Apple will see people who listen to this also listen to that. Pat gets some cross-promotion in that way too, when he can connect with these other people, but that was the first one that really put him on the map and he started to notice really large spikes in his podcast downloads as a result of getting featured on another person’s podcast. When Pat started his podcast, he was only recording every other week because that’s all he had time for. He was blogging three times a week (whoa!) and inserting YouTube videos randomly. He went to a conference shortly after his podcast was starting to gain exposure… and that’s all everyone wanted to talk about. The podcast. “But what about my blog?” he asked. He spent most of his time blogging. Then he started to really think about it. The podcast was then recorded weekly and things excelled even faster. “It’s just so cool to see how much it’s really affected people’s lives more than anything. I use the podcast as a platform to a build a relationship and then take those people back to my website so they can download a lead magnet, get involved with my programs, or discover other things that I have going on so that I can better serve them from there. It’s so funny because when I go to conferences now, people come up to me and they talk about the show. They’re talking to me like we’ve been friends forever when I’ve just met that person. Sometimes I have to catch myself and go, ‘I know we’ve been talking for like 15 minutes, but what is your name again? I can’t remember.’ But, we just have this vibe and it’s funny because they remember stories that I tell on the show. 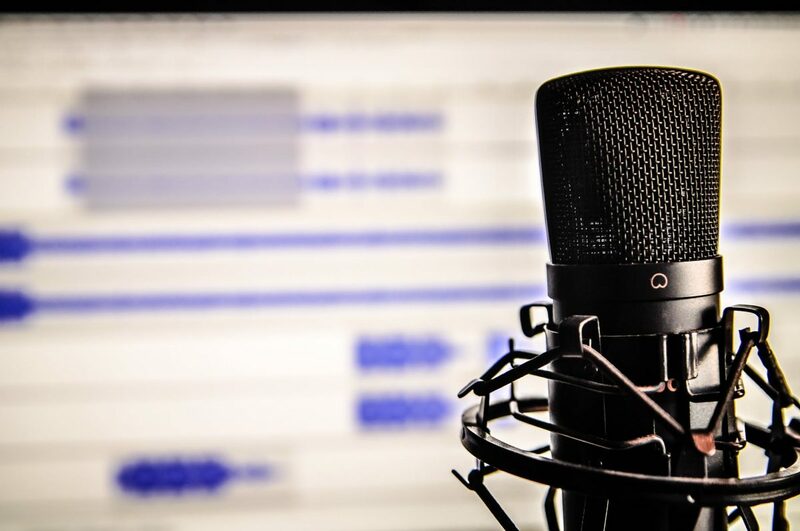 Having a podcast is a great segment of your business, but it also allows new opportunities to come into your life because of the connections you make or the audience you create. If you have a blog or business already, you’re probably doing affiliate marketing by recommending other people’s products and earning a commission as a result of that. You may or may not be making a significant amount of money from that, but having a podcast increases the trust, know, and like factor – especially when you have the founders of these companies that you’re promoting on the show. The tough part of affiliate marketing is that it’s not your own products. That’s also the benefit. It’s not your own product, so you can easily promote something today without having to create something, but at the same time, you have to work a little bit harder to help a person trust that product that’s not even yours. Having a podcast shows people you can hold a conversation on a platform like a stage. A podcast is essentially a stage that you have. It’s just so much easier to work with because you don’t have to travel anywhere, but it definitely also helps with your confidence in your presentation style and communication. There were many doors that opened for Pat after the success of his podcast, but his first speaking gig was thanks to Philip Taylor, or PPI Team Money as he’s known in the in the financial industry. Back in 2011, he was invited to speak at his Financial Blogger Conference which had about 350 attendees. He was assigned to speak at a breakout session for about 50 people which he reluctantly said yes to. He was so nervous that he did what he had done with the podcast, which was scripted out – every single word. It actually worked out really well and he was able to talk about his podcast on stage and even get more people to come to listen. That opened up even more opportunities. Having a podcast allows you to have conversations with book publishers and/or agents. Podcasting is more closely aligned with TV, movies, and media, so you start to meet people in those similar industries. Fun Fact: Pat was an extra in a movie (and got to check off the life-long goal of his). He also did some social media for an independent movie that was a result of a person discovering his podcast through iTunes. Pat was able to meet major influencers like Tim Ferriss and Gary Vaynerchuk because of his show. Pat was able to utilize the relationships he made on the movie set as an extra, several years later for a presentation in Vegas in 2015. He wanted to come on stage in a Delorean. It was the 30 year anniversary of Back to the Future, so he wanted to show a short video prior to his arrival on stage, that had him going into a Delorean, disappearing, and reappearing live there in person. He reached out to his connections within Hollywood and was able to film a short film, with a crew of 30 people that was then played at this event. It was literally filmed on the same parking lot that Back to the Future was filmed on. It’s funny because when I was probably in elementary or middle school, my grandfather had an old-fashioned car museum with hundreds of old-fashioned cars… and he had two Deloreans. For Pat, I’m going to find out where the Deloreans were sold to. Besides Smart Passive Income, Pat also has Ask Pat, Food Truckr School, and he just launched a podcast with his son called All Of Your Beeswax, which is currently in production for season two. I thought it was an interesting concept to do it in seasons and not episode by episode, and Pat said it’s because that format works better for their lifestyle since he is recording with his child. They record all at once, batch edit, and release it almost like a Netflix show. Other options for podcasts are to come out weekly, bi-weekly, or once every three months (but is usually a four-hour episode). The cool thing about a podcast is you can do it in any way you want. It’s your show. And so it’s up to you. His other show is Food Truckr School which is a podcast for food truck owners, or potential food truck owners, to help them with marketing their business. He doesn’t own a food truck but got very interested in the food truck space in 2010, which led to his second go-around to building a niche website. The first time it was about the security guard training industry. He created a website which still ranks number one in the security guard training rankings on Google. There was an opportunity in his research where he saw a lot of people looking for this information. So, he built a website teaching people how to become security guards and it did very well. That helped inspire a lot of people, so he did the second round, teaching people how to start food truck businesses. Back to security guard training… after doing research, he realized there isn’t great information out there so he decided to create the top resource for people looking to become a security guard. The food truck website is a separate one which is a little bit more involved. He hired a team to continue to write. It provides him a few thousand dollars every single month through some products sold there. The podcast supports that website, which only has 29 episodes. It was a series of episodes done over one year. Pat hasn’t even created a new episode in four years, yet the podcast still gets 3,000 downloads per month. Every month, he is still able to passively help these people, and then, introduce them to his evergreen products. Now you might be asking yourself, how is he even positioning this? He’s not even a food truck owner! It was a website and a resource that was written by him and his team. They did research exactly as if they wanted to create a food truck website or start a food truck business, so one day they would know exactly how to do it. Pat is very honest on the website that he’s not a food truck owner, but may want to be one day… which is still true. The positioning was to go and talk to as many food truck owners as possible to discover exactly how to do this, and then they can follow along on how to do these things, too. Most food truck owners are so busy every day and they don’t necessarily have the time to read, but they absolutely have the time to listen while they’re prepping their food. Pat even said that business is an asset that people want to buy it from him, but the passive income is just so great for how little work he puts in, that he’s keeping it for now. If the offer is big enough, he might just sell it, because it was just an experiment that has gone very well, like many of his other things. He wanted it to be there to show people how it’s done. It is updated regularly by his team as regulations change, but the evergreen content is there: the cost, the way to do customer service, the way a food truck is built, the things you need in the truck, etc. His most popular article, which was actually the first blog post published on that website, is about 50 food truck owners speaking out about the number one thing they wished they known about before they started their food truck. “Hey, I’m creating this website. I’m looking to put together a resource to help food truck owners. I’d love for you to be a part of it. Please, please answer this one question. I’ll feature it in the blog post. Again, he got four responses. A week later, he reached back out to the 246 people that didn’t respond and got 46 more replies. So, just by the nature of following up, he got 50 people total and packed that all into one blog post and just listed their food truck and what they wish they had done. On Reddit, there are around 2,500 comments on it… and that’s still providing a lot of traffic to the website. Its simple articles like that that are very useful can do very, very, good. Years later it’s still a top resource in the food truck industry because you get to know from real food truck owners what they wish they knew about. Isn’t that something you’d want to know if you were an up and coming in the industry, too? The secret sauce to winning in anything is really nailing down what the pains and problems are of your target market, then provide things that can help them with that. If you can provide something that will help more people even later then that’s great, and that’s the beauty of doing business and creating platforms online. It‘s easily accessible and if it’s still useful and relevant today, then people are going to continue to share it and consume it… and Google can also help out, or YouTube, or algorithms. By putting things out there, you’re opening up these opportunities for yourself. Knowing whether or not you’ll need to update it for years depends on the industry that you get into. Pat was lucky with the LEED exam website because there’s only a finite amount of information needed and that doesn’t change very often. The keyword research was the start. That’s what made him realize there was some potential. Then he needed to have conversations with food truck owners and people who were interested in food trucks to see what their pains and their problems were. That’s how he knew what to talk about on the podcast and on the blog. With the security guard training website, for example, Pat didn’t know the answers so he put himself in the shoes of somebody who wants to become a security guard. He guessed that someone would probably start by calling a security guard company, and asking them how to get started. He found out that in every state in the US, they have a different set of rules that you need to go through and different websites that you needed to get approved and background checks. He called every security guard training company in every state and recorded those conversations so that he could write down all that information. Then, he put it on a website. He literally went to the source to understand what it takes and it became the top website because it had the best information. All the answers are right there. That’s all he did. He found the answers. He didn’t know the answer, so he went and found them. He listed it: step one, step two, step three, step four, step five, step six, etc. In some states, it was just one thing. In other states, like California, you have to take an exam and all these other things. So, that gave him access to all of these programs that help people pass an exam. Then, he called those companies to see how they could work together and became an affiliate for some of them. You just follow the path that you put yourself on. But unless you take action, you’re just going to sit there and do nothing. The worst thing is expecting magic to happen. Magic doesn’t happen. There’s no magic in this. There’s hard work and creating opportunities. That’s it. What if 10 years ago you had the idea for security guard training and did nothing, and now you see Pat Flynn with a security guard training school making passive income. You’re not making any money with it and it was your idea 10 years ago! If you do research and you find that somebody else has already done what you’re doing, let that be a sign that you did have a good idea and there is a market out there. Also, realize that you can create a better solution or a different solution. Sometimes different is better than just better. The best businesses out there are the ones that take what somebody has already started, that is not so good and just make it better. Pat wasn’t the first person to create websites about how to become a security guard, but he definitely created the best one out there – the one that was the easiest to go through and have the most up–to–date information. Then, he placed a job board on there and connected with Indeed.com. He embedded that on his website so people could find security guard training jobs in their area. Every time somebody connects with a potential employer, he gets two or three bucks. That has provided over $10,000 of income over the years. How can I make that happen easier and faster for them? How can I make their lives more convenient? Go all out with answering those questions and you’ll win. Join an Accelerator Program… like I did with Pat! I’ve known Pat for a couple of years, I’ve been on his podcast a couple of times, but now I get to see his face from across the country almost every week because I’m in his accelerator program. This was the first go-round of him doing a high-end mastermind accelerator program, which is really funny that it’s called that because it does excel people’s businesses. The funny thing is that it’s also the decelerator program because, in order to excel, you have to slow down a little bit and focus. “I knew there were these more advanced people who needed a different kind of training,” Pat said about the program I’m in… which by the way, I am obsessed with everybody in the accelerator program.